Alexandra van der Geer is one of the world's leading experts on the “island rule” of evolution. She has co-authored the standard reference on this topic “Evolution of Island Mammals”. 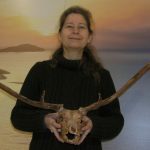 The focus of her research is on insular mammals, past and present, of the Mediterranean and of Southeast Asia. Payments are handled securely via Stripe.